Warning: Linked photos are of a graphic nature that may be disturbing. View with caution. Since guns are the most frequently used weapons in murders, and firearms account for more than half of the slayings today, a Massachusetts criminal defense lawyer must possess an intimate understanding of firearm forensics. At the Mahoney Criminal Defense Group we have a forensic expert on our staff who is available to examine gun shot evidence collected by the Commonwealth. An expert in forensics is often indispensable to a murder defense. In an effort to determine precisely how and when a specific crime took place, forensic investigators have studied gun shot wounds in great detail. The examination of gunshot wounds has often been the deciding factor in the prosecution or exoneration of the accused. We have provided photographs of gunshot wounds to illustrate what we are describing. Gunshot wounds can be either penetrating or perforating. In a penetrating wound, the bullet enters an object and remains inside, while in a perforating wound, the bullet passes completely through the object. In some cases, the wound can be both penetrating and perforating, in that it penetrates some part of the body, such as the head, but perforates certain parts, such as the skull or brain. In a perforating wound, the bullet creates an exit wound as it escapes the body. An exit wound differs greatly from an entrance wound. An entrance wound is surrounded by a reddish-brown area of abraded skin, known as the abrasion ring, and small amounts of blood escape through. An exit wound, on the other hand, is larger and more irregular, with extruding tissue and no abrasion ring. There is far more blood that escapes an exit wound, and it can possibly be profuse. After the bullet enters through the skin, the skin retracts due to its elasticity. This will make the wound appear smaller than the bullet that has passed through. The bullet usually travels in a straight line, but its direction is unpredictable if it hits a bone. When this occurs, the bone may be shattered or the bullet may deflect and be sent to another area of the body. To win a trial, a Cambridge Criminal Defense Lawyer must be able to recreate a shooting. Examination of the gunshot wound can help determine many factors involved in the shooting, including the distance of the shooter from the victim. Gunshot wounds can be classified based on the range from the muzzle of the gun to the target. These classifications include contact, near-contact, intermediate, and distant wounds. A contact wound results when the muzzle is held against the body at the time of discharge, and can be further divided into hard, loose, angled, and incomplete contact wounds. In a hard-contact wound, the muzzle is held tightly against the skin. There is little external evidence that it is a contact wound, although if you inspect the entrance you will usually find searing and powder blackening of the immediate edge of the wound, while an autopsy will reveal particles of soot and unburnt powder in the wound track. In loose-contact wounds, the muzzle is held lightly against the skin, and the soot that is carried by the gas is deposited in a zone around the entrance, which can be wiped away. In an angled-contact wound, the barrel is held at an acute angle to the skin, and gas and soot radiate outwards from where the gun does not touch the skin. In an incomplete-contact wound, the barrel is held against the skin, but in a place where the skin is not completely flat. In this case, hot sooty gases escape the gap, leaving a long blackened and seared section of the skin, with scattered grains of powder. In near-contact wounds, the muzzle is not in contact with the skin, but is very close. In this case, the powder grains do not have a chance to disperse and leave a powder tattooing. The entrance wound is surrounded by a wide zone of powder soot, and seared, blackened skin. In intermediate-range wounds, the muzzle is held away from the skin but close enough that it still produces powder tattooing. This type of wound is also characterized by numerous reddish-brown to orange-red lesions around the entrance to the wound. Finally, distant gunshot wounds leave no marks other than those produced by the bullet perforating the skin. While it is rare that a victim will have died just before being shot, a criminal defense lawyer must consider all possibilities in recreating a shooting and, especially, determining the cause of death. An examination of the wound can also indicate whether or not the victim was alive when he was shot. If a reddish-brown to orange-red powder tattooing exists, that indicates that the individual was in fact alive when the wound was inflicted. However, if the powder has produced gray or yellow marks instead, the individual was dead before the shooting. The type of gun used in the shooting can usually be determined by examining the gunshot wound. The shotgun, particularly the 12-gauge, is the most common and most deadly weapon in America today. Fired at close range, the shotgun is the most destructive of all small arms. 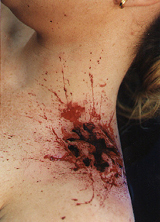 Shotgun wounds can be characterized by massive tissue destruction and embedded wadding if the shot was within ten feet. By examining the wadding, one can determine the type of shot, gauge of gun, and possible evidence to identify the gun. The handgun and .22 caliber rimfire weapons produce wound variations based on whether the gunshot was contact, near-contact, intermediate or distant. Generally speaking, handguns produce larger and more prominent tattoo patterns than rimfire weapons because of the use of flake powder. Rimfire weapons instead use ball powder, which produces extremely fine but faint tattooing. The extent of the injuries that both handguns and .22 caliber rimfire weapons inflict are usually confined to the tissues and organs directly in their path. Wounds inflicted by center-fire rifles differ from those of the other weapons in that they can damage organs, bones, and tissue without even coming into contact with them. This type of gun has higher velocities and higher kinetic energies than the others, and therefore possesses the potential to produce extremely severe wounds. The organs that are directly hit by the bullets of these guns may partially or completely disintegrate, and the pressure is powerful enough to fracture bones and rupture vessels close to the wound. A gunshot wound from a centerfire rifle can cause tissue to eject not only from the exit wound but also from the entrance, and as a result it is not uncommon to find ejected tissue on both sides of the wounded body. For the Cambridge criminal defense lawyer defending an individual accused of murder or assault with a dangerous weapon, determining whether the accused actually fired a weapon is critical. Scientists have used many methods over the years to determine whether an individual has fired a firearm. By the mid 1980’s, scientists had come up with three generally accepted methods of analyzing gunshot residues- neutron activation, flameless atomic absorption spectrometry (FAAS), and scanning electron microscopic-energy dispersive x-ray spectrometry (SEM-EDX). These three methods were all based on the detection of metallic elements on the back of the hand that fired the weapon. By the mid-1990’s neutron activation was discarded because it could not detect lead, which is used in rimfire weapons, and also because a nuclear reactor was needed to perform the tests. Flameless atomic absorption spectrometry (FAAS) detects many elements, including lead. In this method, the scientist uses cotton swabs dipped into nitric or hydrochloric acid to wipe the palms and backs of hands. The scientist then looks at the distribution of antimony and barium, and can determine whether the amounts discovered are consistent with the gunshot residue one would acquire from firing a weapon. One also must consider where the gun residue is found; if the residue is on the back of the hands, the individual likely fired the weapon, whereas if the residue is on the palms, it indicates a defensive gesture or the handling of a gun with residue on it. When the weapon is a rifle or shotgun, the residue is usually detected on the non-firing hand because it is used to hold the gun steadily. The major problem with FAAS analysis is that you can never be absolutely sure that the metallic residue detected is from a firearm. An individual can also test positive simply by picking up a gun that was recently discharged, though in that case the residue would be on the palms rather than the back of the hands. This method also produces a high percentage of false negatives. Therefore, a negative result is meaningless, and does not mean that the individual did not fire the weapon. When using FAAS analysis, you must test for residue shortly after the incident. As time increases between the firing of the gun and the taking of the sample, the residue is rapidly lost. Washing your hands and even just rubbing them causes a loss of residue. The test results almost always are negative when the time between the firing and the taking if the sample is greater than two to three hours. Scanning electron microscopic-energy dispersive x-ray spectrometry (SEM-EDX) uses computer controlled analysis to test residue. Material is removed from the hand using adhesive lifts. The particles are scanned using SEM, and analyzed by EDX. SEM-EDX is far more reliable than FAAS in revealing positive results. Residue is detected in 90% of the cases where people have fired a handgun. Rifles, however, account for the majority of the negative results. Unlike FAAS, particles observed under this analysis can be identified absolutely as gunshot residue. Also, with SEM testing, the analysis has been positive up to 12 hours after the firing of the weapon. The only weakness of SEM is that scientists cannot differentiate between those individuals that fired a gun, handled a gun, or made a defensive gesture while being shot or shot at. To distinguish such individuals, a more thorough examination would have to be undertaken to determine how the residue was distributed. Trace Metal Detection Technique (TMDT) is another method that is used by some police agencies to determine if gunshot residue is on the hand of the suspect. This method requires the police to spray a reagent on the hand which changes colors based on its reaction with the different metals on the hand. There are many problems with this technique, however, including the fact that results are affected by how long the weapon was held and whether the defendant was sweating. The test is also not specific, and the metal that is traced could have come from many other sources over the last 48 hours. The passage of a bullet through clothing can alter the appearance of the wound and cause the examiner to reach different conclusions regarding factors such as the range of the gunshot. When there is clothing between the firearm and the skin, you will not find soot and powder on the skin, and searing is lessened or can be prevented. Therefore, the usual methods of determining the distance of the shooter from the victim cannot be used. Whether the powder passes through the clothing depends on the material, the number of layers of clothing, and the form of the powder. Ball powder can penetrate up to three layers of clothing, while flake powder may fail to penetrate a single layer. Gunshot wounds through clothing can be telling, however, in that they can help determine the physical position the victim was in when he or she was shot. By lining up the holes in the clothing with the entrance and exit wounds, it can be determined whether the victim was sitting, standing, slouched, or in another position. In many murder or shooting cases, a criminal defense lawyer may have to challenge the credibility of the prosecution’s claim that a particular weapon fired the bullet that struck the victim. The bullet itself is often analyzed in an attempt to determine the weapon that was used in the shooting. Forensic experts examine the appearance of grooves, the number of grooves, the diameter of the lands and grooves, the width of the lands and grooves, the depth of the grooves, the direction of the rifling twist, and the degree of the twist. Imperfections of the bullets may be specific to only one weapon, identifying that weapon as distinctly as fingerprints. If there are no grooves on the bullet, it was likely fired from an oversized weapon, such as a rifle. If there are elongated grooves with deep incisions, it was likely fired from an undersized weapon. Skid marks are another characteristic that one might notice when examining a bullet. If skid marks exist, the bullet was likely fired from a revolver. Skid marks occur when the grooves are wider at the nose of the bullet than at the base. One may also find the presence of powder marks on the bullet. Powder marks most often occur on lead bullets or full-metal jacketed bullets that have lead exposed at the base. These marks are a result of the powder grains being propelled against the base of the bullet with such a force that they leave a marking. Different forms of powder can also leave different marks on the bullet. Recovered bullets can be compared to other bullets to determine the make of the gun. When a bullet is recovered and there is also a suspect weapon in custody, an examiner uses the weapon to fire a bullet into a test box. The two bullets are then examined under a microscope to see if the markings are the same. However, it is unlikely that the two are similar, even if shot from the same firearm. Though the analyzation of the bullet can give the examiner a lot of information, it is not always possible. For instance, a bullet that has been removed from a body can be too mutilated to be useful. If the bullet was fired from a gun for which it was not chambered, it can be distorted, as in the case of an automatic producing skid marks. Finally, bullets recovered from decomposed bodies are likely to be partially or completely useless in making any determinations about the nature of the weapon. Kevin J. Mahoney is a Cambridge, MA criminal defense lawyer who has successfully defended clients accused of murder. Contact him by calling 617-492-0055 to schedule a free in-office consultation to discuss your case. Bailey, F. Lee, and Rothblatt, Henry B. Crimes of Violence, Homicide and Assault, The Lawyers Co-operative Publishing Co., New York, 1973. Di Maio, Vincent J. Gunshot Wounds: Practical Aspects of Firearms, Ballistics, and Forensic Techniques, Second Edition, CRC Press, New York, 1999. Eckhert, William G., and James, Stuart H. Interpretation of Bloodstain Evidence at Crime Scenes, Second Edition, CRC Press, New York, 1998. Geberth, Vernon J. Practical Homicide Investigation: Tactics, Procedures, and Forensic Techniques, Third Edition, CRC Press, New York, 1996.